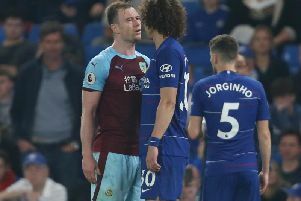 Ashley Barnes is finally close to a return to action. The striker has been on the sidelines since feeling his hamstring in the 4-1 friendly win at Bradford City in July. And he could supplement Sean Dyche's pool of forwards ahead of Andre Gray returning from his four-match suspension. Dyche said: "We're having a bit of better news with him, he's at the end stage of an injury that just wouldn't settle, but seems to be now. "He's not back active with us as a group yet, but he's active with the physio so we're hopeful with that. "It's been really hard for him, he's worked really hard to get to a base level of fitness, and then this last bit of the injury just won't quite settle, so we're hopeful he's getting over that hurdle now. "It's very frustrating for him. "He's a tough-minded lad, so it's been a hard run for him, but it happens. "Hopefully he's getting to the very end now." Gray's ban will be completed in time for the trip to Old Trafford on October 29th, and potentially Barnes could return before then: "We'll see, but he's certainly feeling good at the minute, I don't like to put too many timescales on these things, but we're hopeful he'll carry on progressing. "He's managed to keep his general fitness levels up, so that's quite high, we won't have to go back to square one with him, and have another pre-season. "His general fitness is decent and gives him a head start." With Gray's ban, Burnley are down to Sam Vokes and Patrick Bamford as available strikers, with a number out on loan, including Lukas Jutkiewicz at Birmingham: "The question would be, how come Juke went out? But when he went out, Barnesy was on the verge of fitness, then you've got four strikers. "That's a reasonable amount to have, and they are all different types, which is what I'm looking for. "If you get Barnesy back fit, that looks about right again."